Since graduating from ANU in 1980, Bruce has worked as a geophysicist in private industry and the Northern Territory and Victorian geological surveys. 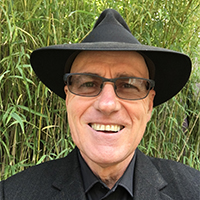 While at the Geological Survey of Victoria and, since 2012, at CSIRO, Bruce has been designing information management systems and a part of international and national collaborative research projects into data exchange mechanisms and interoperability. In addition to the resulting geology (GeoSciML) and groundwater (GroundWaterML) Open Geospatial Consortium data exchange standards, he has applied the methodologies to the mineral resources, soil, marine, gazetteer, water quality, native vegetation, and electricity and water utility domains. In addition to the challenges of harmonising and delivering different data structures (schematic interoperability) and different content (semantic interoperability) these standards help address, there is the additional challenge of seamlessly integrating the different schematic and semantic data management technologies. Bruce joined CeRDI in 2017 with the aim to help ensure natural resource management data, information and knowledge is globally available to researchers, government agencies, municipalities and the public, while minimising the overheads to data providers. Wilson, P.L., Simons, B.A., & Ritchie, A. (2014). Opportunities for information model driven exchange and delivery of GlobalSoilMap data and related products. Globalsoilmap: Basis of the Global Spatial Soil Information System, 473-476. Dahlhaus, P.G., MacLeod, A., & Simons, B. (2018). The challenges of making groundwater data FAIR: Findable, Accessible, Interoperable and Reusable. Groundwater and Life: Science and Technology into Action. 45th IAH Congress, September 9th - 14th, 2018, Daejeon, Korea. International Association of Hydrogeologists. Dahlhaus, P.G., Simons, B., Wong, M., MacLeod, A., & Robinson, N. (2018). Making soils data FAIR: Findable, Accessible, Interoperable and Reusable. SOIL: The key to the past, the present and the future. National Soils Conference, November 18th - 23rd, Canberra, Australia. Soil Science Australia. Cox SJD, Simons BA and Yu J (2014) A Harmonized Vocabulary For Water Quality. HIC2014 - 11th International Conference on Hydroinformatics, 2014, City College of New York, New York, USA. Yu J, Simons BA, Car N and Cox SJD (2014) Enhancing water quality data service discovery and access using standard vocabularies. HIC2014 - 11th International Conference on Hydroinformatics, 2014, City College of New York, New York, USA. Simons BA, Yu J and Cox SJD (2013) Defining a water quality ontology using QUDT and ChEBI. MODSIM2013, 20th International Congress on Modelling and Simulation, 2013, Modelling and Simulation Society of Australia and New Zealand, Adelaide, SA, Australia. Raymond O, Duclaux G, Boisvert E, Cipolloni C, Cox SJD, Laxton JL, Letourneau F, Richard SM, Ritchie A, Sen MA, Serrano J, Simons BA and Vuollo J (2012) GeoSciML v3.0 - a significant upgrade of the CGI-IUGS geoscience data model. EGU General Assembly 2012, 2012, EGU, Vienna, Austria. Vuollo J, Simons BA, Laxton JL, Cassard D, Seymon A (2012) EarthResourceML v.2.0 - an upgrade of the CGI-IUGS earth resource data model due to INSPIRE Data specification. 34th International Geological Congress, Unearthing our Past and Future - Resourcing Tomorrow, 2012, Brisbane, Australia. Fraser R, Woodcock R, Simons BA and Wyborn L (2010) AuScope Grid: Spatial Information Services Stack. GSDI 12 World Conference, 2010, Singapore. Raymond O, Simons BA and Boisvert E (2010) Information Models for the Australian geoscience community: GeoSciML, EarthResourceML and GroundwaterML. Australian Earth Sciences Convention, 2010, Canberra, Australia. Woodcock R, Simons BA, Duclaux G, Cox SJD (2010) AuScope's use of standards to deliver earth resource data. EGU General Assembly 2010, 2010, Vienna, Austria. Bibby LM, Callaway GA, Higgin DV, Morand VJ, Simons BA and VandenBerg AHMV (2008) Follow the yellow brick road: lessons from the path to seamless digital geological map data from Oz(tralia). 33rd International Geological Congress, 2008, Oslo, Norway. Ritchie A, Simons BA (2008) Object-Oriented Modelling of Geoscientific Information Systems. The 33rd International Geological Congress, 2008, Oslo, Norway. Seymon A, Simons BA, Raymond O and Wyborn L (2008) The Australian mineral occurrence data exchange model. Australian Earth Sciences Convention (AESC) 2008. New Generation Advances in GeoScience, 2008, Geological Society of Australia. Seymon A, Simons BA, Raymond O and Wyborn L (2008) The Australian Mineral Occurrence Data Exchange Model. The 33rd International Geological Congress, 2008, Oslo, Norway. Simons BA, Bellier C, Brodaric B, Cox SJD, Fusejima Y, Janjou D, Johnson BR, Laxton JL, Raymond O and Richard SM (2008) GeoSciML 2.1.0: Significant changes and additions to the CGI-IUGS geoscience data model. The 33rd International Geological Congress, 2008, Oslo, Norway. Simons BA and CGI Interoperability Working Group (2008) The GeoSciML logical data model of geological concepts. Australian Earth Sciences Convention, 2008, Perth, Australia. Seymon A, Wyborn L, Simons BA, Raymond O, Andrews G, Denaro T, Jenkins G, Lewis P Llorca J and McClenaghan M (2007) The Australian Mineral Occurrence Data Exchange Model. Geoinformatics 2007 Conference, 2007, San Diego, California, USA. Bellier C, Robida F, Serrano J, Brodaric B, Boisvert E, Richard SM, Johnson BR, Laxton JL, Duffy TR, Sen MA, Simons BA, Ritchie A, Wyborn L, Cox SJD and Stolen LK (2006) GeosciML, the Geosciences Markup Language. 3rd International Conference on GIS in Geology, 2006, Moscow, Russia. Duffy TR, Boisvert E, Cox SJD, Johnson BR, Raymond O, Richard SM, Robida F, Serrano J, Simons BA and Stolen LK (2006) The IUGS-CGI International Geoscience Information Interoperability Testbed. XIth International Congress of the International Association for Mathematical Geology, 2006, Leige, Belgium. Ritchie A, Simons BA, Bibby LM and Silgoe G (2006) A scientific approach to developing Geological Information Systems. Australian Earth Sciences Convention, 2006, Melbourne, Australia. Simons BA, Biosvert E, Brodaric B, Cox SJD, Duffy TR, Johnson BR, Laxton JL and Richard SM (2006) GeoSciML: Enabling the Exchange of Geological Map Data. Australian Earth Sciences Convention, 2006, Melbourne Australia. Cox, S.J.D., Boisvert, E., Brodaric, B., Duffy, T.R., Johnson, B.R., Laxton, J.L., Richard, S.M., & Simons, B.A. (2006). GeoSciML: a standards-based encoding for transfer of geoscience information from IUGS/CGI. XIth Conference of the International Association for Mathematical Geology, 3-8. Richard, S.M., Boisvert, E., Brodaric, B., Cox, S.J.D., Duffy, T.R., Holmberg, J., Johnson, B.R., Laxton, J.L., Robida, F., & Simons, B.A. (2006). GeoSciML-A GML application for geoscience information interchange. 2006 Philadelphia Annual Meeting. Simons, B.A., Boisvert, E., Brodaric, B., Cox, S.J.D., Duffy, T.R., J, B.R., Laxton, J.L., & Richard, S.M. (2006). GeoSciML: enabling the exchange of geological map data. ASEG Extended Abstracts, 1-4. Simons BA, Ritchie A, Bibby LM, Callaway GA, Welch S and Miller B (2005) Designing and Building an Object-Relational Geoscientific Database Using the North American Conceptual Geology Map Data Model (NADM-C1) from an Australian Perspective. IAMG'05: GIS and Spatial Analysis, 2005, Toronto, Canada. Brodaric, B., Boisvert, E., Lucido, J., Simons, B., Dahlhaus, P., Grellet, S., Chery, L., & Kmoch, A. (2016). OGC WaterML 2: Part 4 - GroundWaterML 2 (GWML2) (B. Brodaric, Ed.). Wayland, Massachusetts: Open Geospatial Consortium. Box, P., Simons, B.A., Cox, S.J.D., & Maquire, S. (2015). A Data Specification Framework for the Foundation Spatial Data Framework. Morand, V.J., Simons, B.A., Taylor, D.H., Cayley, R.A., Maher, A., Wohlt, K.E., & Radojkovic, A.M. (2005). Bogong 1:100000 map area geological report. Geological Survey of Victoria Report (125). Melbourne, Australia: GeoScience Victoria. VandenBerg, A.H.M.V., Willman, C.E., Morand, V.J., McHaffie, I.W., Simons, B.A., Quinn, C., & Westcott, A. (2004). Buffalo 1:100000 map area geological report. Geological Survey of Victoria 1:100000 Geological Explanatory Notes (124). Melbourne, Australia: GeoScience Victoria. Morand, V.J., Wohlt, K.E., Cayley, R.A., Taylor, D.H., Kemp, A.I.S., Simons, B.A., & Magart, A.P.M. (2003). Glenelg special map area geological report. Geological Survey of Victoria Report (123). Melbourne, Australia: Geological Survey of Victoria. Taylor, D.H., Wohlt, K.E., Simons, B.A., Maher, S., Morand, V.J., Vincent, J., & Sapurmas, P. (2000). Creswick 1:100000 map area geological report. Geological Survey of Victoria Report (117). Melbourne, Australia: Geological Survey of Victoria. Simons, B.A., & Moore, D.H. (1999). Victoria 1:1000000 Pre-Permian Geology. Geophysical Maps. Melbourne, Australia: Geological Survey of Victoria. VandenBerg, A.H.M.V., Hendrickx, M., Willman, C.E., Magart, A.P.M., Simons, B.A., & Ryan, S.M. (1998). The geology and prospectivity of the Benambra 1:100000 map area, eastern Victoria. Geological Survey of Victoria Report (114). Melbourne, Australia: Geological Survey of Victoria. Orth, K., VandenBerg, A.H.M.V., Nott, R.J., & Simons, B.A. (1995). Murrindal 1:100000 Geological Map Report. Geological Survey of Victoria Report, 100. Melbourne, Australia: Geological Survey of Victoria. Edgoose, C.J., Camacho, A., Wakelin-King, G.A., Simons, B.A., & Northern Territory Geological Survey Australia (1993). Kulgera SG53-5, Northern Territory. 1:250000 Geological Map Series, Explanatory Notes. Darwin, Australia: Northern Territory Geological Survey. Haines, P.W., Bagas, L., Wyche, S., Simons, B.A., Morris, D.G., & Northern Territory Geological Survey (1991). Barrow Creek SF53-6, Northern Territory. 1:250000 Geological Map Series, Explanatory Notes. Darwin, Australia: Northern Territory Geological Survey. Walley, A.M., & Simons, B.A. (1987). Frew River SF53-3 Northern Territory. 1:250000 Geological Map Series, Explanatory Notes. Darwin, Australia: Northern Territory Geological Survey. Wyche, S., & Simons, B.A. (1987). Bonney Well SF53-2 Northern Territory. 1:250000 Geological Map Series, Explanatory Notes. Darwin, Australia: Northern Territory Geological Survey.